Not sure where abouts in the world you are reading this but in the UK South East region, it has been so sunny and lovely today! I’m going to go straight into the post today as I’m excited to share with you some of my thoughts. Urghhhh, Instagram. Where do we even start. I have a love/hate relationship with Instagram. Some days I love it, the net day I am just hating on it. As you are all probably aware the new algorithm of Instagram has completely changed the game and often the posts you want to see get missed as they do not show up on your feed in time order (as they used to). Instead the app brings the ‘most popular’ posts to the top which leaves some of the ‘less popular’ ones unnoticed. My more popular I mean high number of likes/comments. It’s a lot harder now to grow a presence on Instagram and I think I few people are suffering from this – especially those who have a small presence and wish to grow their following. It is difficult unfortunately. You may have come across the term ‘Instagram theme’ used loosely and at first I had no idea what this was or what it meant. All I thought was ‘am I missing a trick here and do I need to be jumping on this band waggon’. 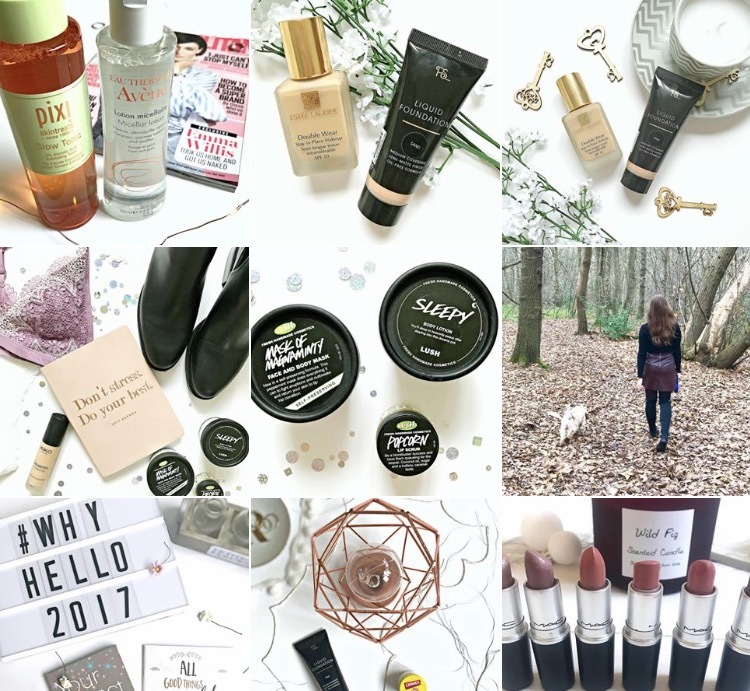 As a relatively new blogger (I started very end of Dec 2016) I feel I need all the tips and tricks to help me grow and develop. I am following some amazing bloggers out there and when I see them post a picture I am literally in awe of their feed. Some are just so aesthetically pleasing it’s a joke. when you go onto their page you can see how consistent they are with colours, positions, products, feels, textures and tones. This is where the theme comes into it! Consistency/ building your ‘brand’ – If you have a consistent look and feel to your photos, then people are more likely to recognise your photo and post a mile away rather than scrolling right past it not knowing it was you. It is a good way to build a good following who regularly like and comment on your images, helping beat the algorithm. Aesthetics – Obviously, like most things, the more consistent things are the better they look, I think it just looks nicer when you have a feed when everything matches – it is much easier on the eye. No Freedom – It is hard to keep up with a theme 24/7. You have to have a mind full of ideals to constantly come up with something that goes with your theme. You have to be selective with what you choose to take pictures of and post and sometimes you are limited to what goes with your theme, so you do not have as much freedom. Repetition – If you are constantly posting photos that look and feel the same, you have to make sure these photos have something different to the last one you posted and can add value to your feed. Your followers may get bored seeing the same old photos again and again. If you are just photographing the same items time and time again, why are your followers going to like it again and again. Following the crowd – Do you want to always follow the crowd and do things like everyone else? I’m not sure its always a good idea to do this. Sometimes in life you get places due to being different and standing out from the crowd, so maybe by not having a theme you are doing this? So, what I have I done with my Instagram feed?? I have tried to create some sort of consistency by choose blush/ pink soft tones but I wouldn’t say all my photos look exactly the same (which is what I don’t want). Below is a photo of what my Instagram feed looked like when I first started. You will see there is not much consistency, and they all look really different. I’d love to know your thoughts on this topic? Do you have a theme, or would you like to establish one? I’m not a fan of themed Instagram accounts, but I like the ones where the photos are edited similarly. I’m not a fan of the same backgrounds in all photos! I can’t help but feel that if i do pursue the themed approach, i will lose my individuality. 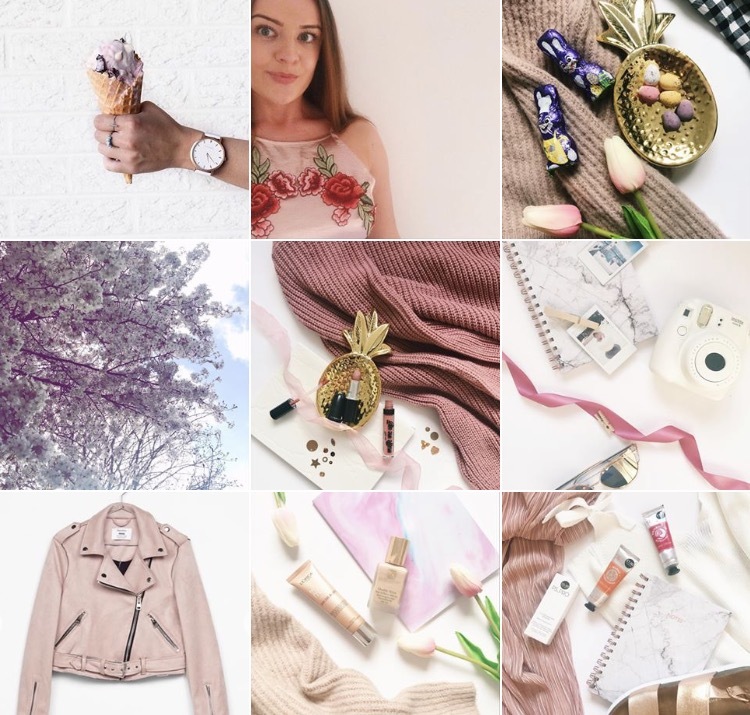 So many blogger instagrams are themed pink, white and grey and i don’t feel that is the point of instagram. Then again, that is all instagram is now, themed accounts and that is what gets a following. It is a catch 22 situation.